not only for us here, but everywhere, for everyone who is of our age; to some more, and to others less. It is the common fate of our generation. To-day we would pass through the scenes of our youth like travellers. We are burnt up by hard facts; like tradesmen we understand distinctions, and like butchers, necessities. We are no longer untroubled–we are indifferent. We might exist there; but should we really live there? We are forlorn like children, and experienced like old men, we are crude and sorrowful and superficial–I believe we are lost. The first bomb, the first explosion, burst in our hearts. We are cut off from activity, from striving, from progress. We believe in such things no longer. We believe in the war. We do not fight, we defend ourselves against annihilation. It is not against men that we fling our bombs, what do we know of men in this moment when Death is hunting us down–now, for the first time in three days we can see his face, now for the first time in three days we can oppose him; we feel a mad anger. No longer do we lie helpless, waiting on the scaffold, we can destroy and kill, to save ourselves, to save ourselves and to be revenged. . . . [C]rouching like cats we run on, overwhelmed by this wave that bears us along, that fills us with ferocity, turns us into thugs, into murderers, into God knows what devils; this wave that multiplies our strength with fear and madness and greed of life, seeking and fighting for nothing but our deliverance. If your own father came over with them you would not hesitate to fling a bomb at him. A word of command has made these silent figures our enemies; a word of command might transform them into our friends. At some table a document is signed by some persons whom non of us knows, and then for years together that very crime on which formerly the world’s condemnation and severest penalty fall, becomes our highest aim. But who can draw such a distinction when he looks at these quiet men with their childlike faces and apostles’ beards. Any non-commissioned officer is more of an enemy to a recruit, any schoolmaster to a pupil, than they are to us. And yet we would shoot at them again and they at us if they were free. These hours. . . . The gurgling starts again–but how slowly a man dies! For this I know–he cannot be saved, I have, indeed, tried to tell myself that he will be, but at noon this pretence breaks down and melts before his groans. . . . By noon I am groping on the outer limits of reason. . . . every gasp lays my heart bare. This dying man has time with him, he has an invisible dagger with which he stabs me: Time and my thoughts. And this is only one hospital, one single station; there are hundreds of thousands in Germany, hundreds of thousands in France, hundreds of thousands in Russia. How senseless is everything that can ever be written, done, or thought, when such things are possible. It must be all lies and of no account when the culture of a thousand years could not prevent this stream of blood being poured out, these torture-chambers in their hundreds of thousands. A hospital alone shows what war is. And all men of my age, here and over there, throughout the whole world see these things; all my generation is experiencing these things with me. What would our fathers do if we suddenly stood up and came before them and proffered our account? What do they expect of us if a time ever comes when the war is over? Through the years our business has been killing;–it was our first calling in life. Our knowledge of life is limited to death. What will happen afterwards? And what shall come out of us? 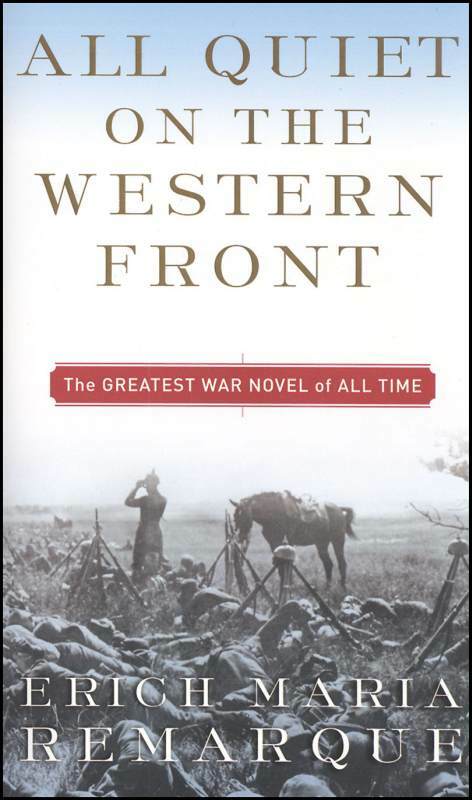 I had been interested in reading All Quiet on the Western Front for many years; I finally read it as part of my preparation for my Somerville Novelists seminar. It is an example of what Testament of Youth is not: a soldier’s story, a first-hand (if fictionalized) account of fighting and survival and tactics and rations and brothers in arms. It is the masculine story of the war, and as many of the critics I’ve read point out, that’s the valorized story, the “authentic” one. Brittain knew these aspects of the war only second-hand, through the letters she received from the front and through her experience as a nurse. There are many points of convergence, though. Above all, both tell a story of lost innocence. And both focus almost exclusively on the personal, on individual disillusionment, devastation, and loss–but both lead us towards political conclusions by making it impossible to understand what cause could possibly be worth such a price. Outside their books, we might well feel there’s an argument to be had about that. Reading them, though, it’s hard to do anything but mourn. From the Novel Readings archives (lightly updated). First published September 2, 2012. 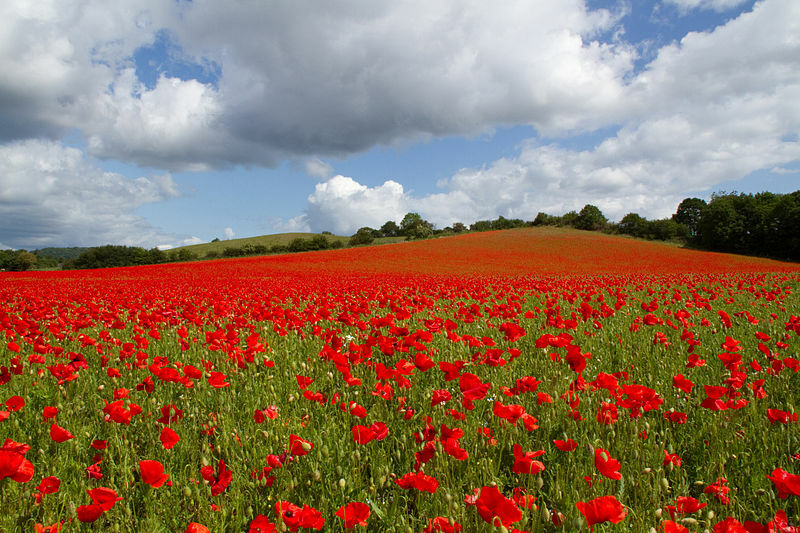 Photo of field of poppies from Wikimedia Commons. A word of command has made these silent figures our enemies; a word of command might transform them into our friends. At some table a document is signed by some persons whom none of us knows, and then for years together that very crime on which formerly the world’s condemnation and severest penalty fall, becomes our highest aim. But who can draw such a distinction when he looks at these quiet men with their childlike faces and apostles’ beards. Any non-commissioned officer is more of an enemy to a recruit, any schoolmaster to a pupil, than they are to us. And yet we would shoot at them again and they at us if they were free. I have been interested in reading All Quiet on the Western Front for many years, but I’m reading it at this particular moment as part of my preparation for my Somerville Novelists seminar. It is an example of what Testament of Youth is not: a soldier’s story, a first-hand (if fictionalized) account of fighting and survival and tactics and rations and brothers in arms. It is the masculine story of the war, and as many of the critics I’ve been reading point out, that’s the valorized story, the “authentic” one. Brittain knew these aspects of the war only second-hand, through the letters she received from the front and through her experience as a nurse. There are many points of convergence, though. Above all, both tell a story of lost innocence. And both focus almost exclusively on the personal, on individual disillusionment, devastation, and loss–but both lead us towards political conclusions by making it impossible to understand what cause could possibly be worth such a price. Outside their books, we might well feel there’s an argument to be had about that. Reading them, though, it’s hard to do anything but mourn.